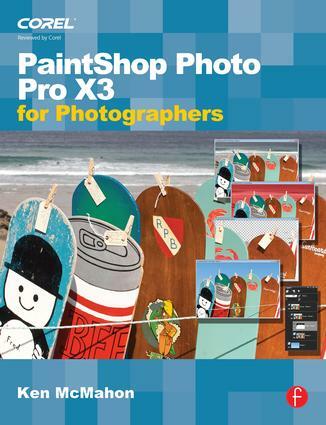 If you are a digital photographer who's new to PaintShop Photo Pro or digital imaging in general, or have recently upgraded to the all-new version X3, this is the book for you! Packed with full color images to provide inspiration and easy to follow, step-by-step projects, you'll learn the ins and outs of this fantastic program in no time so you can start correcting and editing your images to create stunning works of art. Whether you want to learn or refresh yourself on the basics, such as effective cropping or simple color correction, or move on to more sophisticated techniques like creating special effects, everything you need is right here in this Corel-recommended guide. Useful information on printing and organizing your photos and a fantastic supplemental website with tons of extras rounds out this complete PSPP learning package. "While there are hundreds of books for the various versions of PhotoShop, it seems like there are very few books available for Paint Shop Pro. So just finding Paint Shop "Pro for Photographers" was a treat, but to have be such a thorough and easy to use reference was a stroke of luck. I've really enjoyed reading it, and it's provided me with a lot of useful tips and guidance." Ken McMahon runs Pelican Graphics, a digital design consultancy specializing in design and artwork production for print media and the web. He is also a freelance journalist, writing for PCWorld, Mac User and PC Pro in the UK, and a best-selling author.